Silly or Safe Fashion? 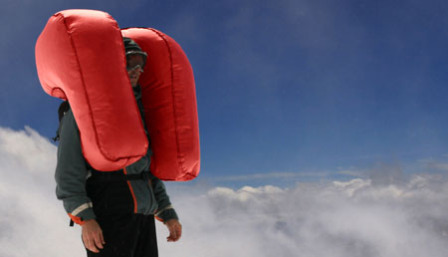 Lifebag Cushions Your Head So You Don’t Lose Your Marbles! Lifebag airbag for your head makes sure you don't lose your marbles during unexpected threats to your noggin. It's a strange safety device that takes safety to the extreme. But rest assured, whether you're involved in extreme sports or convinced the grim reaper's about to come and claim you, the Lifebag is always ready to inflate and save your head from environmental, or even personal threats. 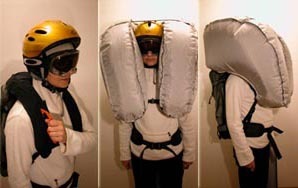 This silly fashion item certainly isn't made for paranoid fashionistas; the portable airbag for your head resembles a parachute style backpack when un-inflated and once the airbag is deployed creates an enormous cushion around your head and shoulders. So it's not stylish, but that's not really the point of this weird and wacky gadget which was originally designed to protect skiers in the wrong place at the wrong time, during an avalanche. While it seems like this funny airbag for your head might make sure your head stays on during other unsafe scenarios, like flying shoes or fists, the situation better not be too urgent since the Lifebag takes three full seconds to inflate. The Lifebag isn't meant to replace typical safety equipment, like helmets, protective eye gear and safety guards for the rest of your body, so if you're going to invest in this silly fashion for safety; you might want to reconsider ever leaving the house or finding yourself a bubble to travel around in. Social Media Game Beats Out Facebook & Google As Top Online Destination? That isn't a head protection device, but an avalanche safety mechanism as alluded to in your post. It's designed to give you better flotation should you become caught in an avalanche so that you don't become buried and suffocate in the snowpack. It protects your head only in an avalanche. These avalanche airbags have been in use in Europe for decades and are slowly making their way over to N. America. If I'm not mistaken, that specific company has started sales in Canada this winter with plans to expand into the US in 2010.